SCVHistory.com LW3371 | Tom Mix | Letter Re: Exhibition of 'Three Jumps Ahead' (Fox 1923). 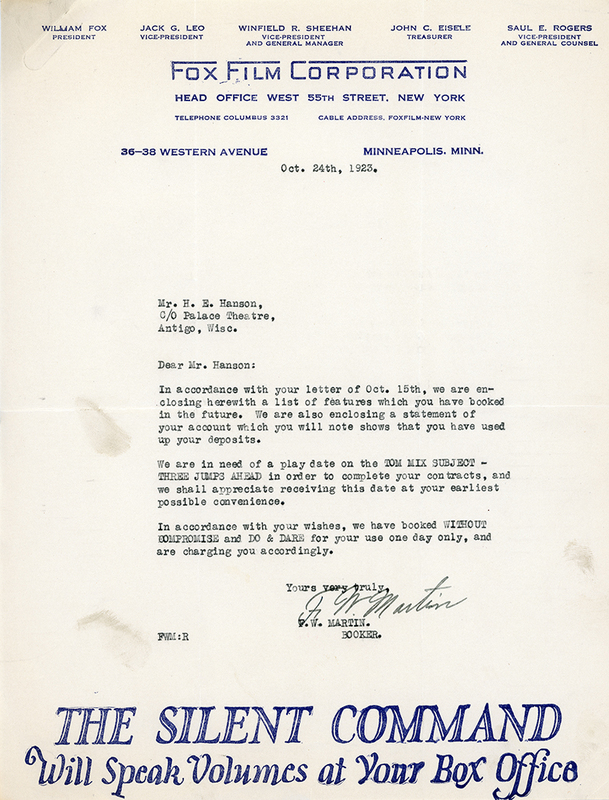 Letter: Exhibition of "Three Jumps Ahead"
Typewritten letter dated October 24, 1923, to a theater owner in Wisconsin regarding fulfillment of his contract from Fox Film Corp.'s distribution arm in the Midwest. Fox rep F.W. Martin is telling H.E. Hanson of the Palace Theatre in Antigo that he must order "Three Jumps Ahead" to fulfill his exhibition contract. "Three Jumps Ahead" is the picture in which actor Tom Mix and his wonderhorse Tony famously jump over Beale's Cut in Newhall. Or do they? We might never know, considering the film no longer exists. The letter mentions the theater's exhibition of another Mix picture, "Do & Dare" (1922), which filmed in Chatsworth, and the William Farnum vehicle, "Without Compromise" (1922), which filmed in Sonora, Calif. The lettehead advertises the recent release (August 19) of "The Silent Command," a Navy picture with Edmund Lowe and Alma Tell as the hero and heroine. The antagonist is Bela Lugosi. It was Lugosi's first film after emigrating to the United States from Germany. In accordance with your letter of Oct. 15th, we are enclosing herewith a list of features which you have hooked in the future. We are also enclosing a statement of your account which you will note shows that you have used up your deposits. We are in need of a play date on the TOM MIX SUBJECT — THREE JUMPS AHEAD in order to complete your contracts, and we shall appreciate receiving this date at your earliest possible convenience. In accordance with your wishes, we have hooked WITHOUT COPROMISE and DO & DARE for your use one day only, and are charging you accordingly. Tom Mix "jumps" over Beale's Cut in Newhall in the 1923 John Ford 5-reeler, "3 Jumps Ahead," from Fox Film Corp. Mix, whose star rose as Bill Hart's waned, did a lot of filming in the Newhall area from about 1916 to the early 1920s, and ran one of several "Mixville" movie towns in downtown Newhall between San Fernando Road and Newhall Avenue, prior to his establishment of a permanent Mixville in the Silverlake area of Los Angeles. Mix claimed to have jumped Tony over Beale's Cut himself — not once but five or six times to get the shot. Mix biographer Robert S. Birchard, author of "King Cowboy: Tom Mix and the Movies" (1993) tells us he's certain Mix didn't do it. The film itself is lost, but Birchard, who owns seven frames of film showing the jump, insists the stunt was performed by Earl Simpson, a horse trainer and stuntman with a ranch in Searchlight, Nev. Others who've been credited with the stunt over the years are Richard Talmadge and Newhall's own Andy Jauregui. It's possible there is more than one answer. In addition to some crazy-looking cut-and-paste production stills that show the horse and rider drastically out of proportion to the Cut, there were three trailers for the film for different releases, Birchard says. They may have been shot at different times using different people. LW3371: 9600 dpi jpeg from original letter purchased 2018 by Leon Worden.